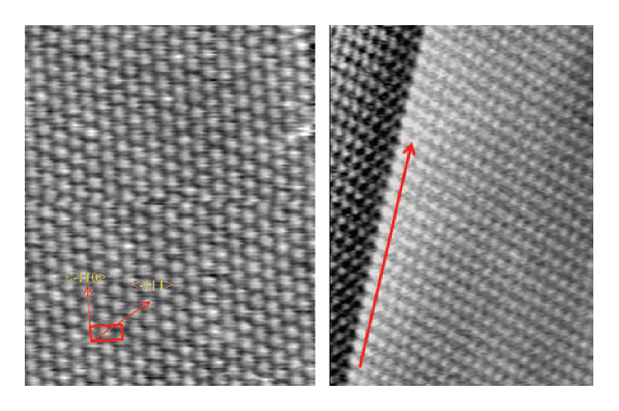 Left Image – STM images of (a, b) the buffer layer and (d) QFMLG. 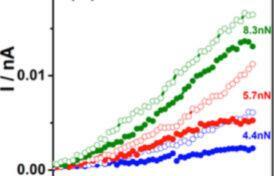 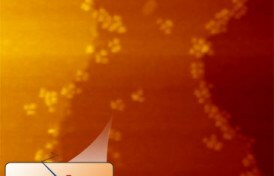 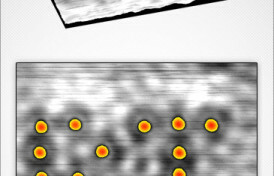 Panel (a) shows the long-range periodicity imposed on the buffer layer by the substrate. 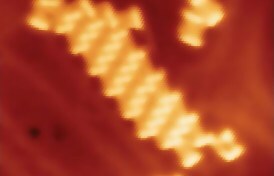 The solid and dashed diamond designates the (6 x 6). 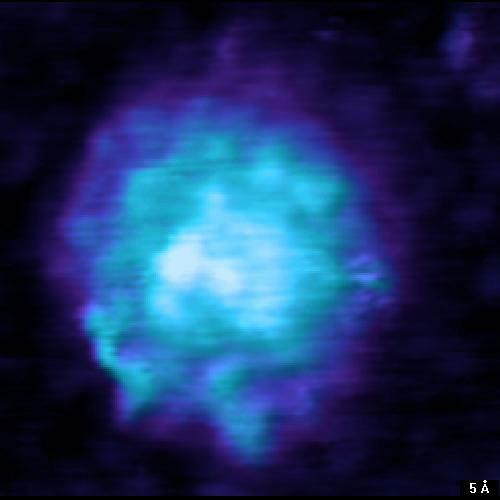 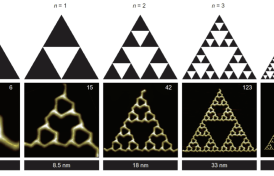 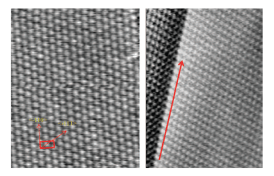 Images in panel (a) were taken with a sample bias of +1.7 V. Under optimal tunneling conditions (main image in panel a) as opposed to earlier stages (inset in (a)) the atomic lattice superimposed on the (6 · 6) periodicity is revealed. 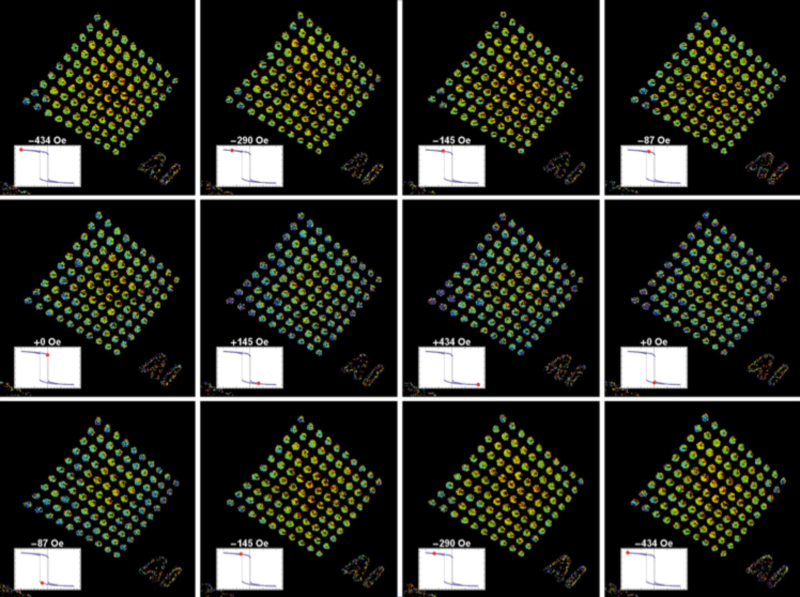 Panels (b, d) are zoomed-in images of the buffer layer and QFMLG imaged with a sample bias of -0.223 V and +0.103 V, respectively. 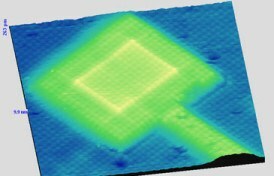 The upper insets in (b, d) present the structural models of the buffer layer and QFMLG, respectively. 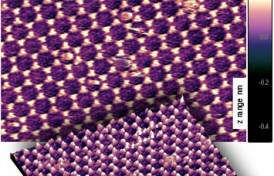 The lower insets in panels (b) and (d) are zoomed in 2D Fast Fourier Transforms (2DFFT) of one of the (1 · 1) spots of the graphene lattice with the quasi-(6 · 6) satellite spots visible only on the buffer layer. 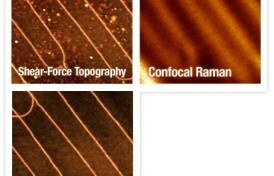 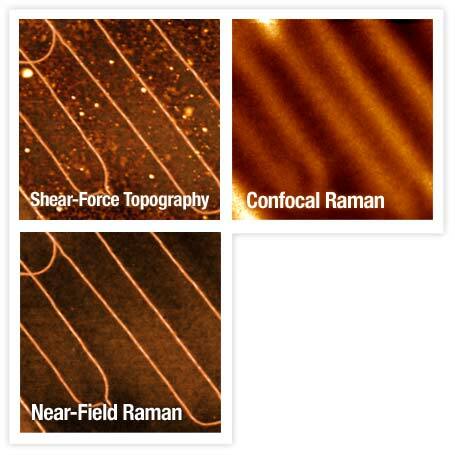 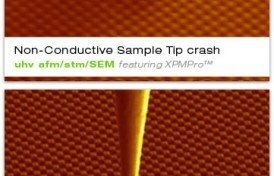 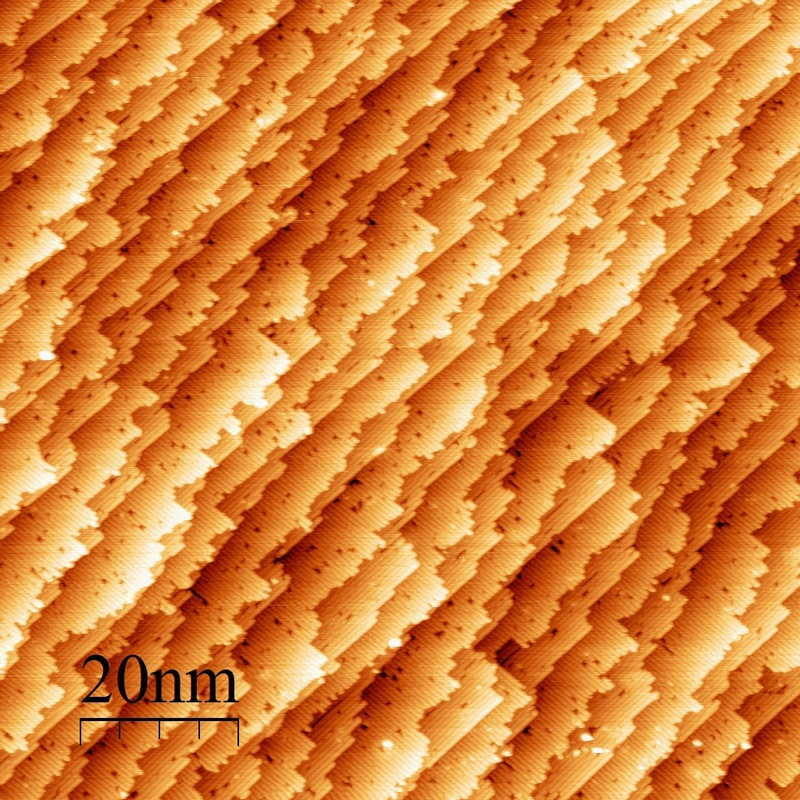 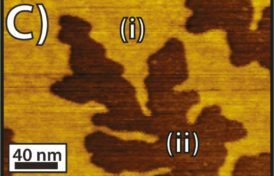 Scale bar 0.58 nm-1. 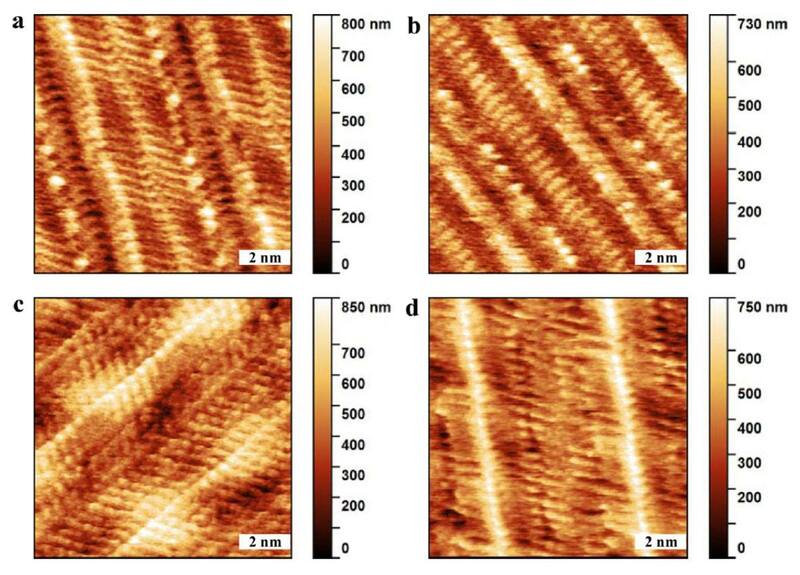 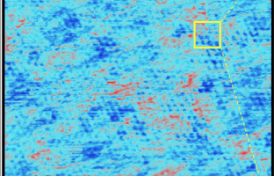 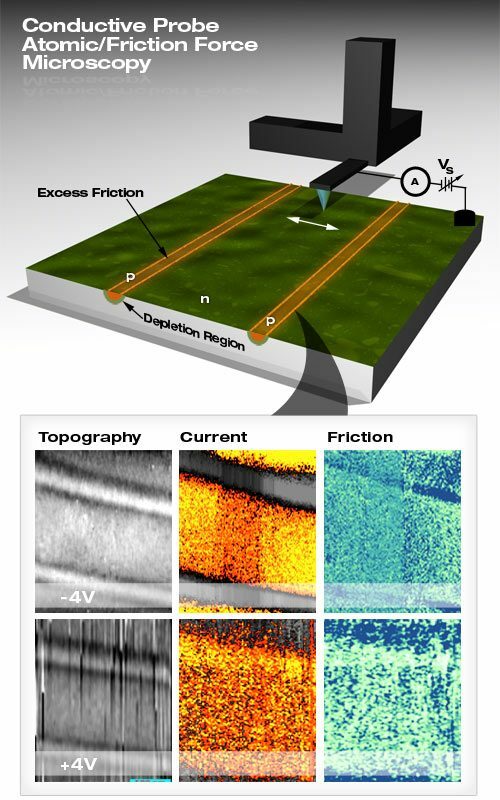 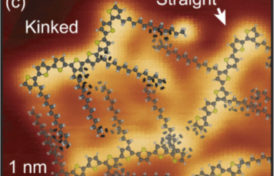 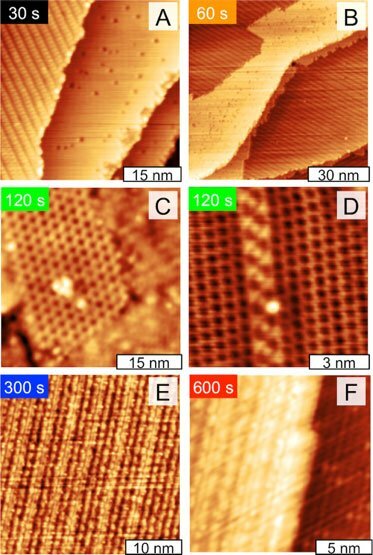 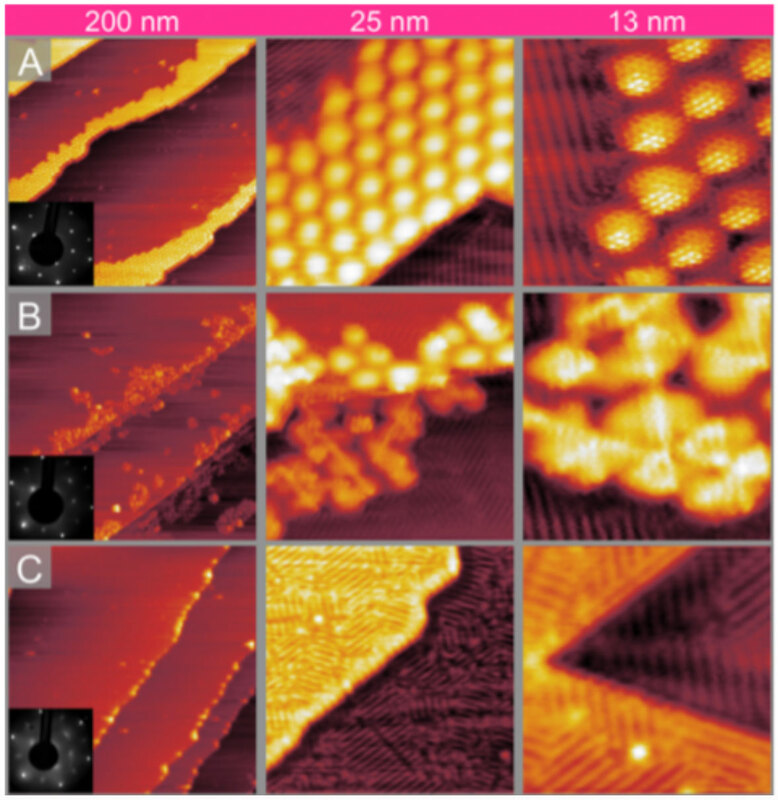 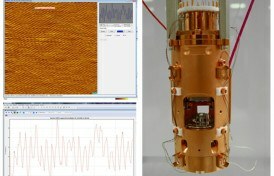 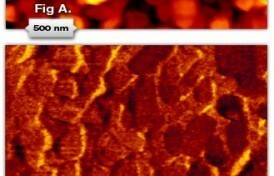 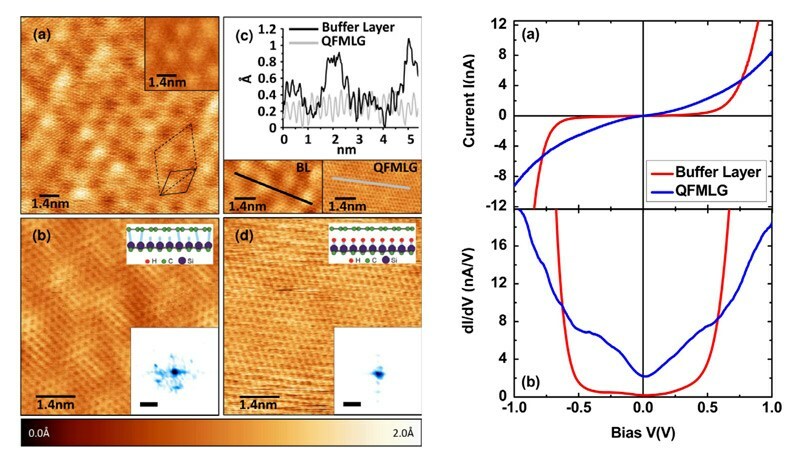 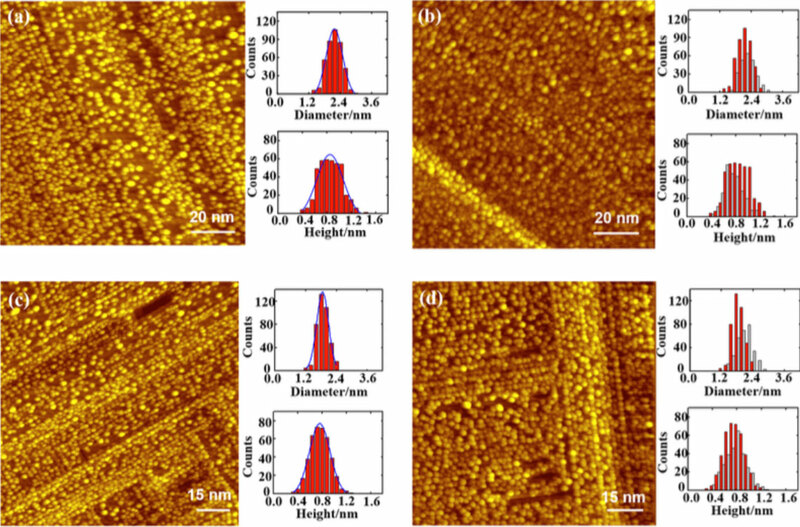 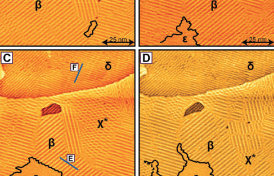 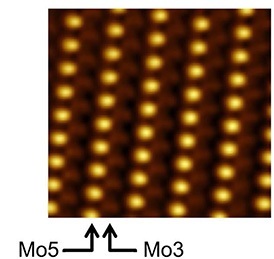 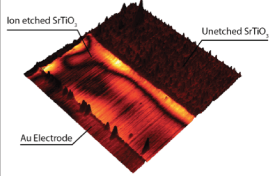 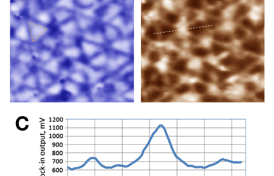 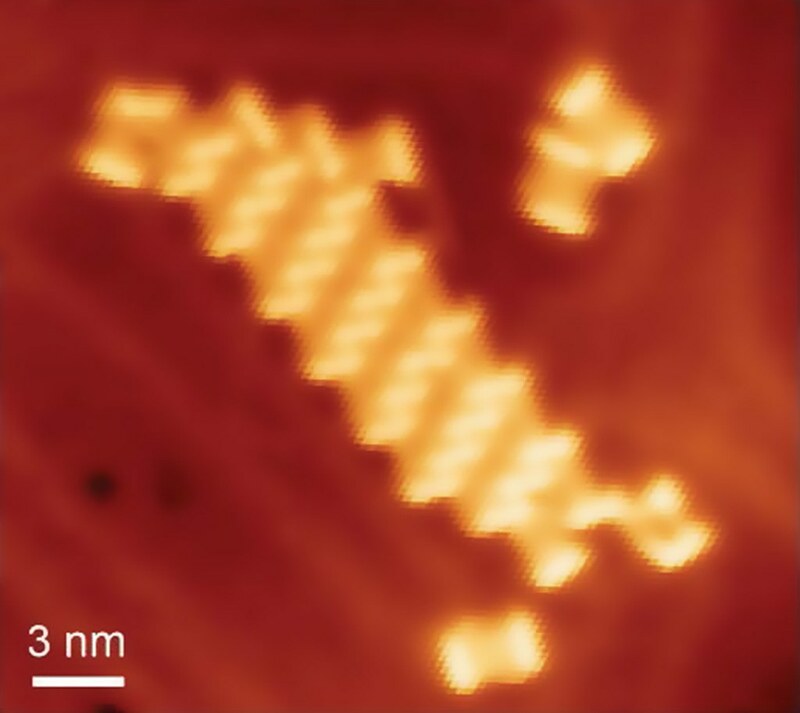 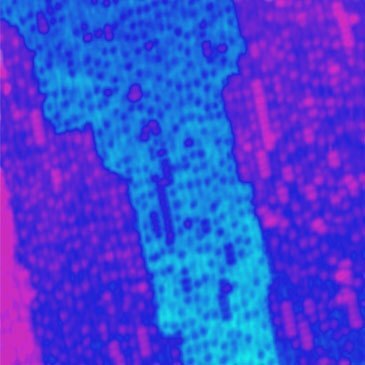 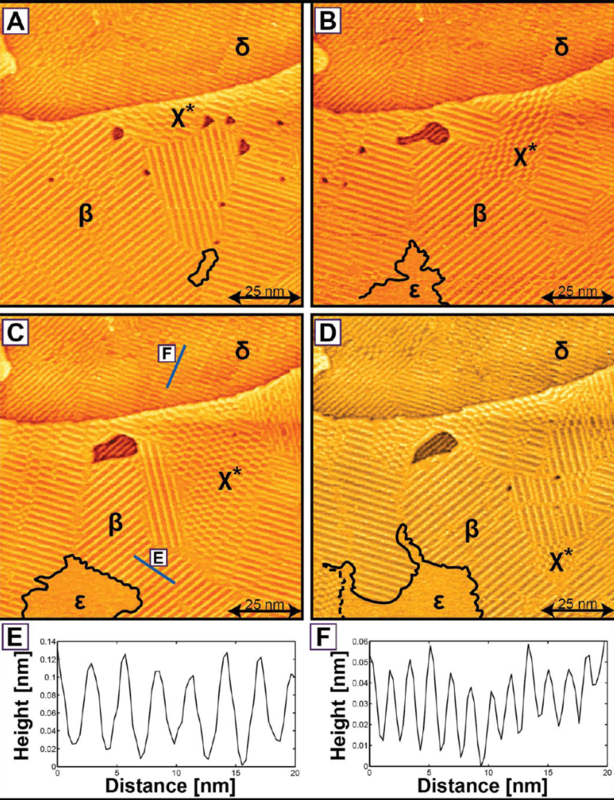 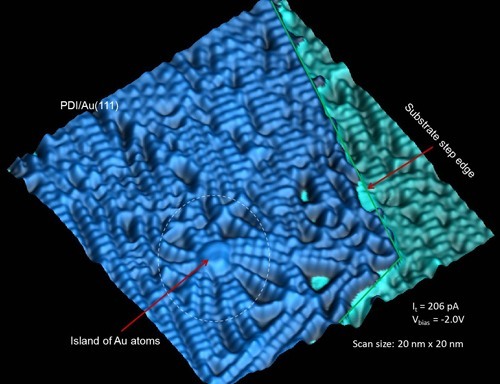 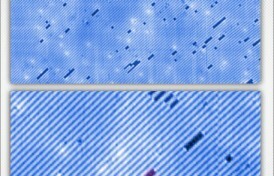 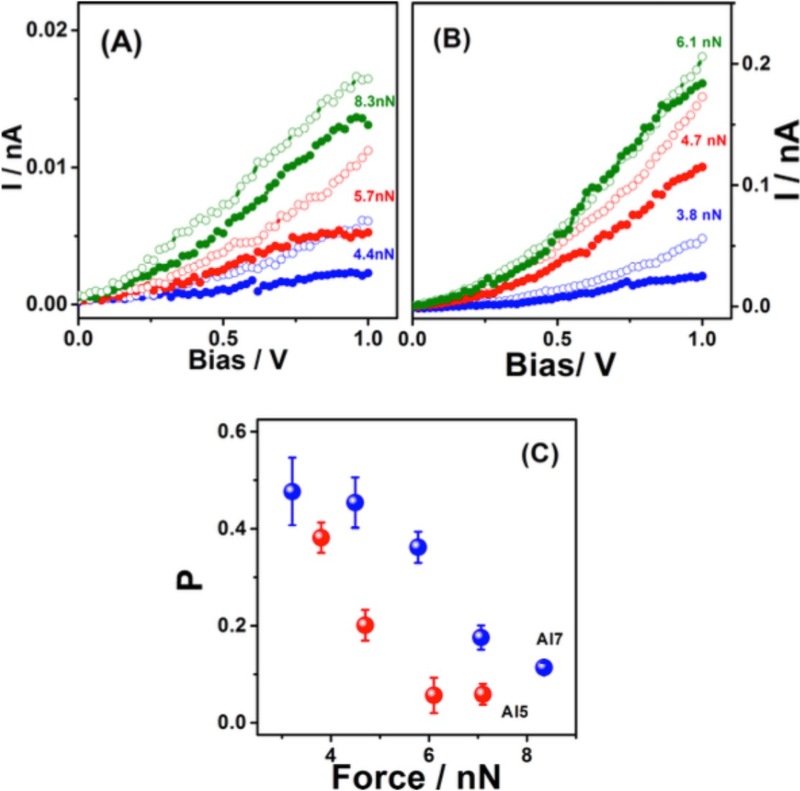 Panel (c) shows atomically resolved STM images taken on the buffer layer and QFMLG and the corresponding line profiles along the graphene periodicity. 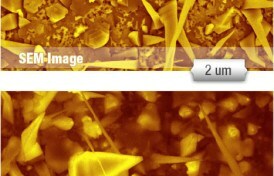 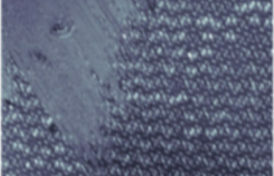 The STM images in panel (c) have been filtered to remove noise. 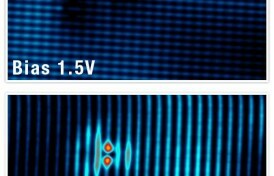 All measurements were taken in constant-current mode with the current set to 0.3 nA. 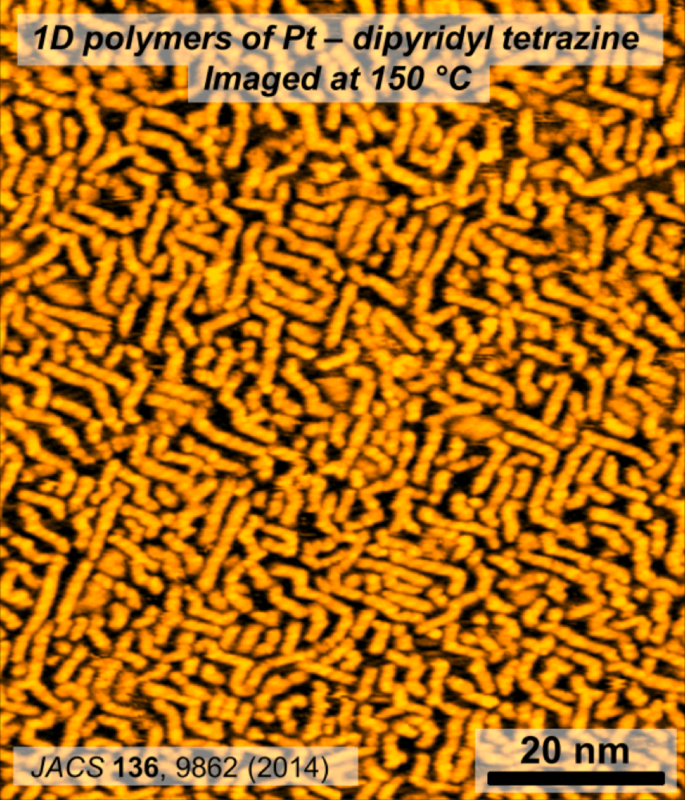 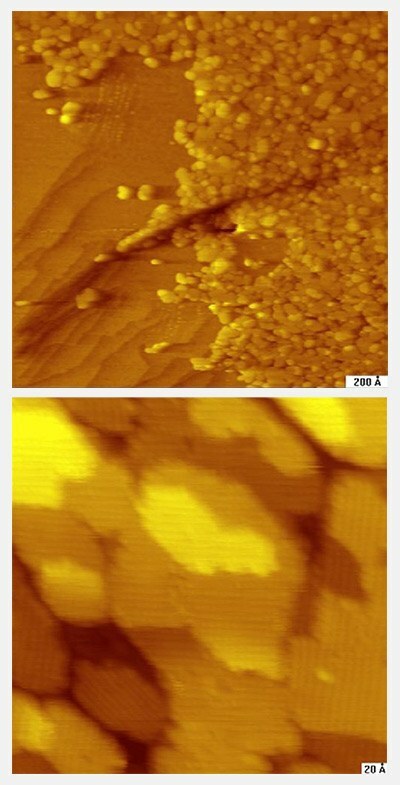 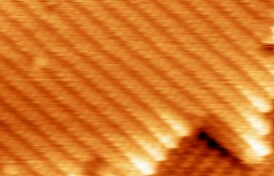 On the SiC(0001) surface (the silicon face of SiC), epitaxial graphene is obtained by subli- mation of Si from the substrate. 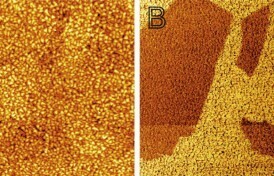 The graphene film is separated from the bulk by a car- bon-rich interface layer (hereafter called the buffer layer) which in part covalently binds to the substrate. 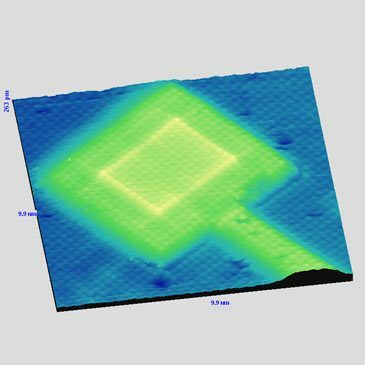 Its structural and electronic properties are currently under debate. 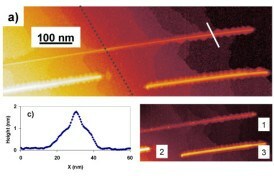 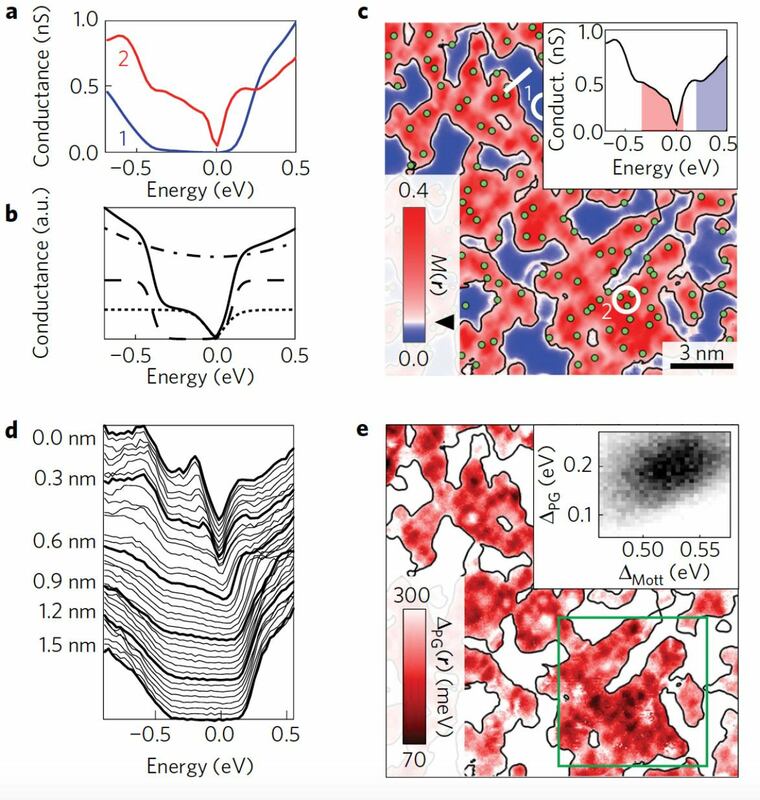 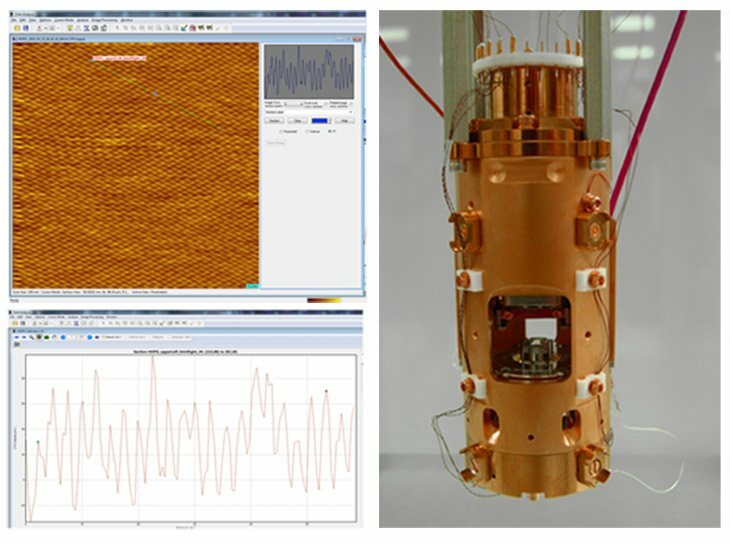 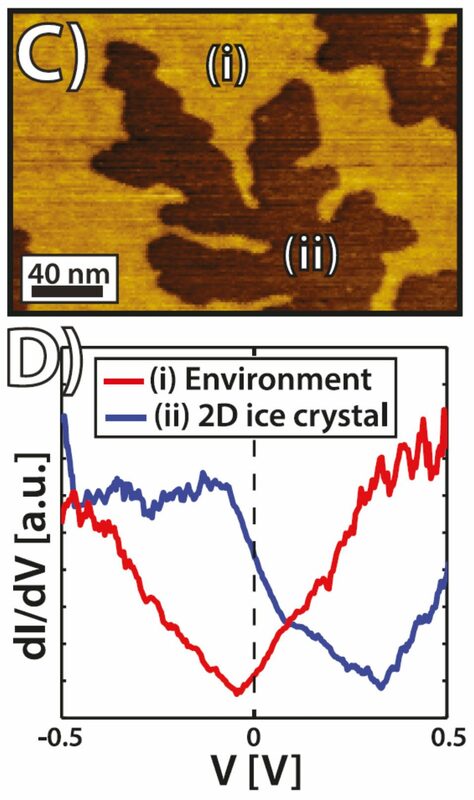 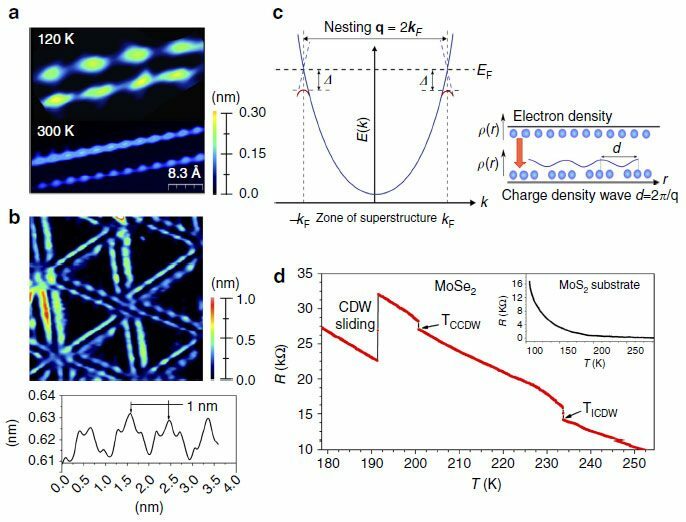 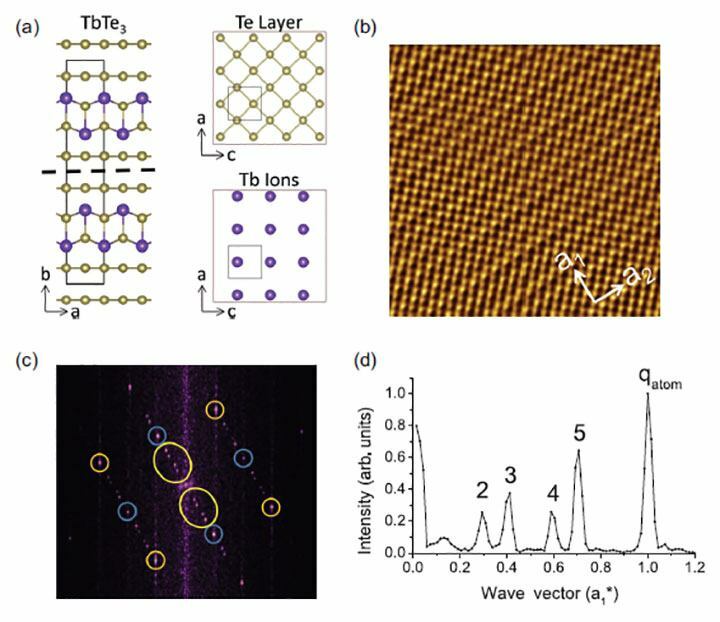 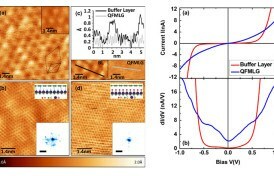 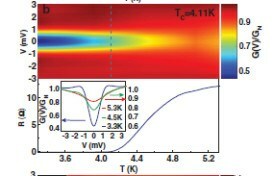 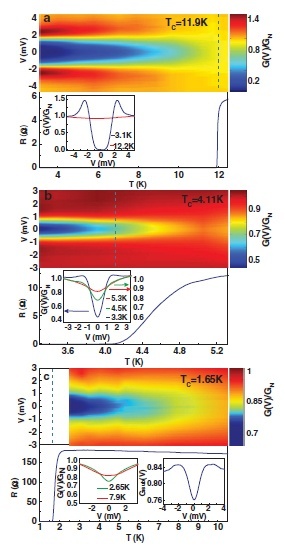 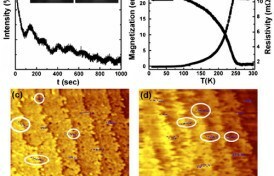 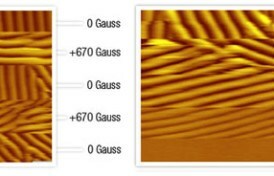 In the present work we report scanning tunneling microscopy (STM) studies of the buffer layer and of quasi-free-standing monolayer graphene (QFMLG) that is obtained by decou- pling the buffer layer from the SiC(0001) substrate by means of hydrogen intercalation. 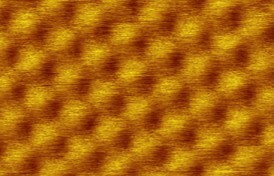 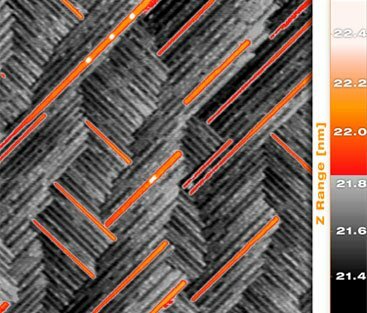 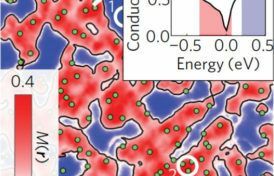 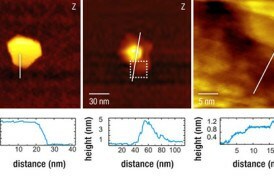 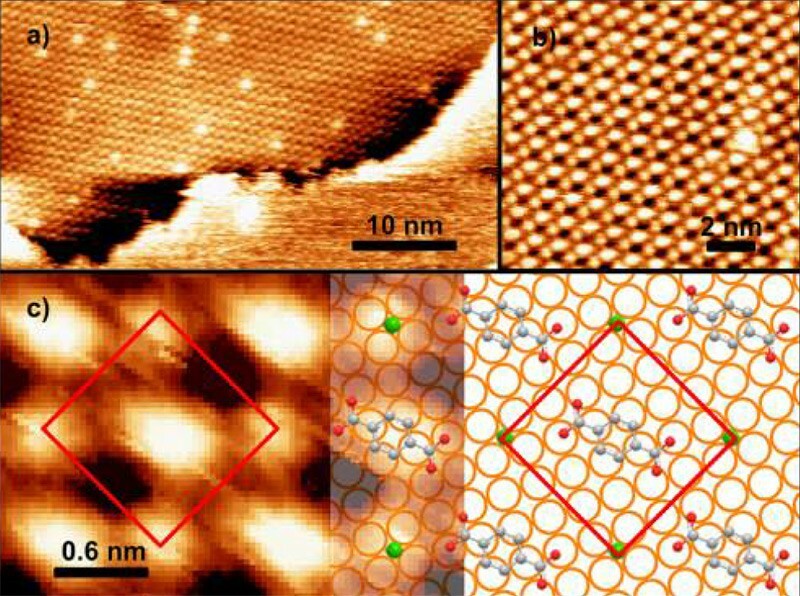 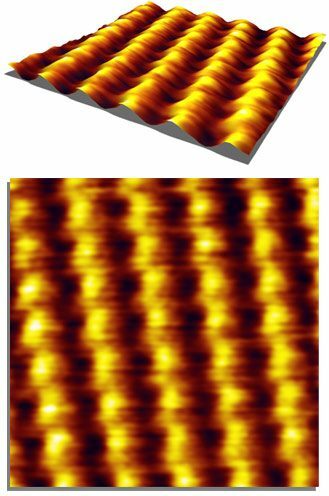 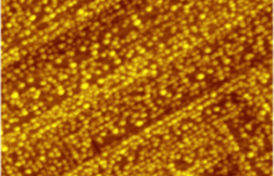 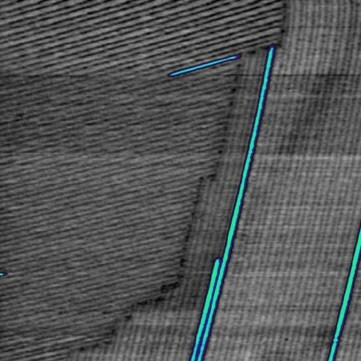 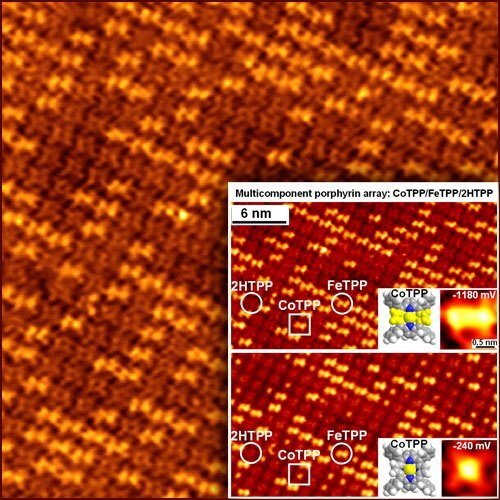 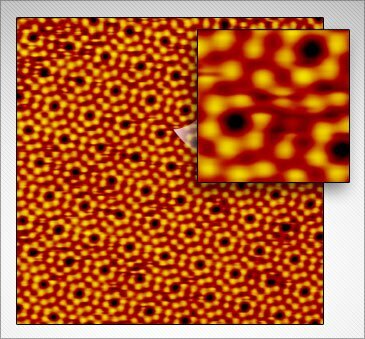 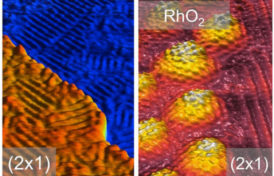 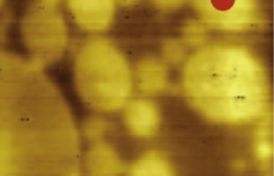 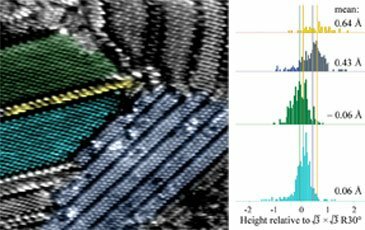 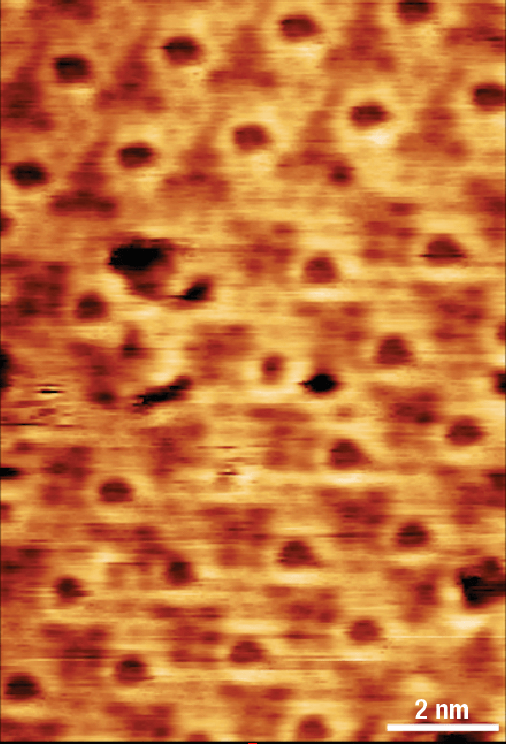 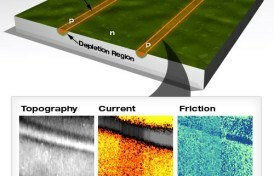 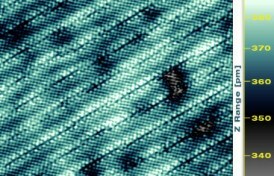 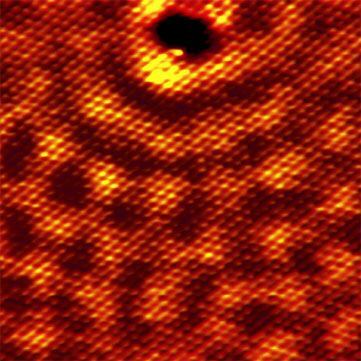 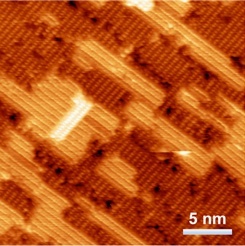 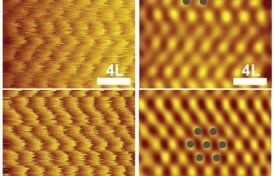 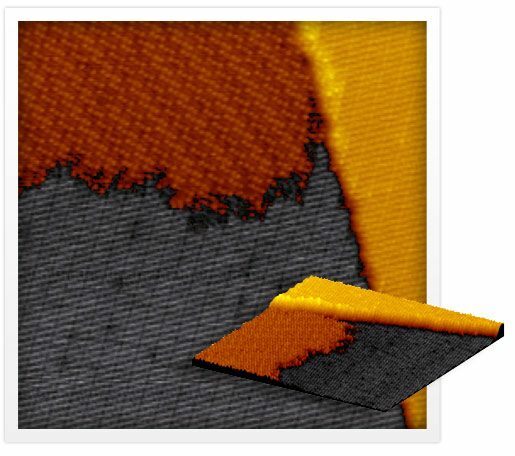 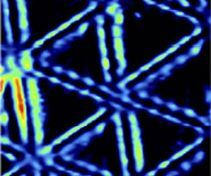 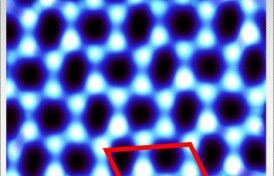 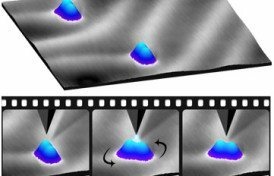 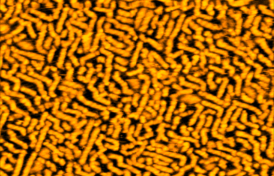 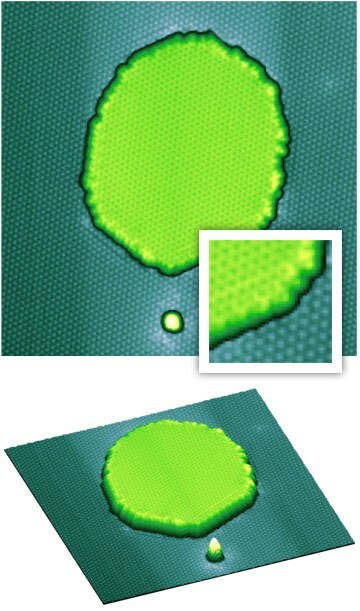 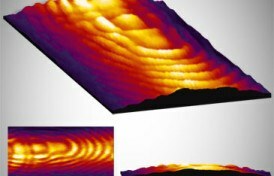 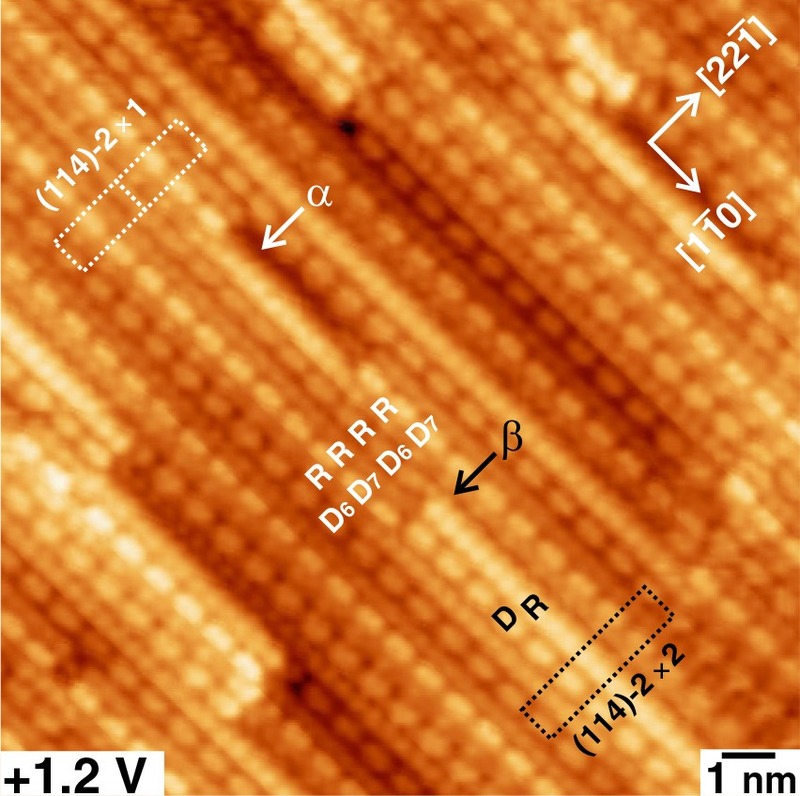 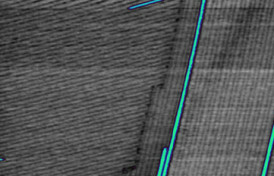 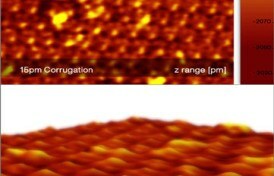 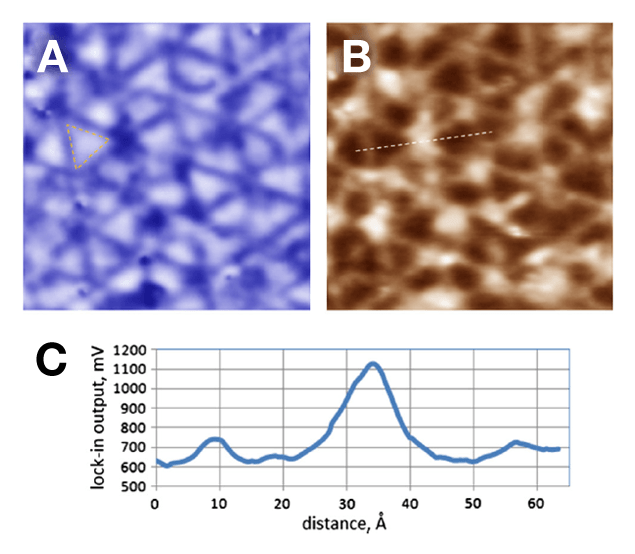 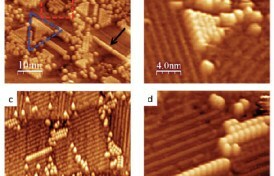 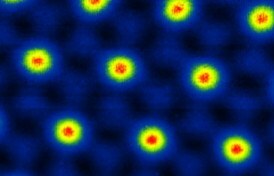 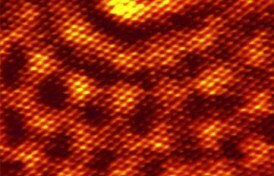 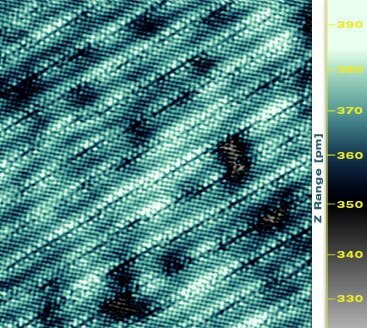 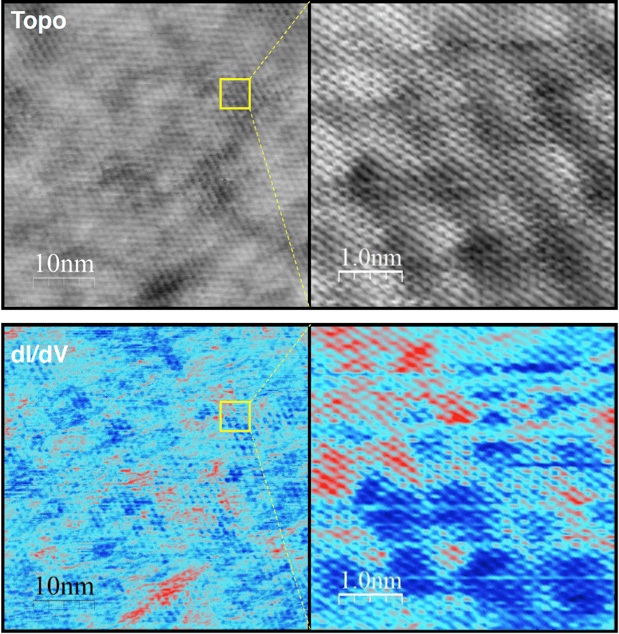 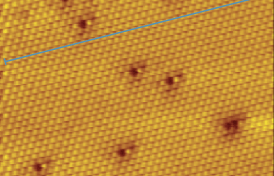 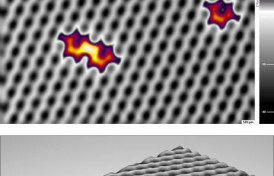 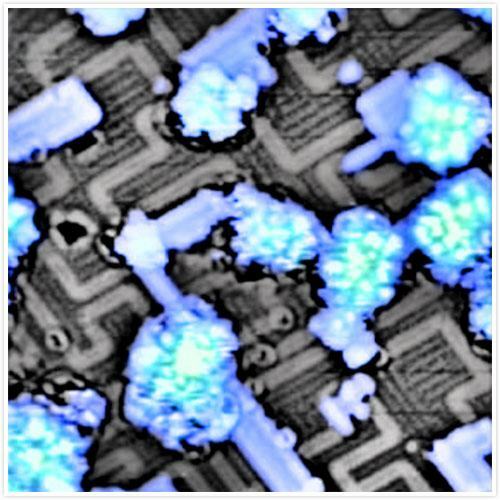 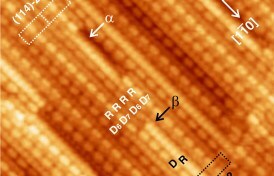 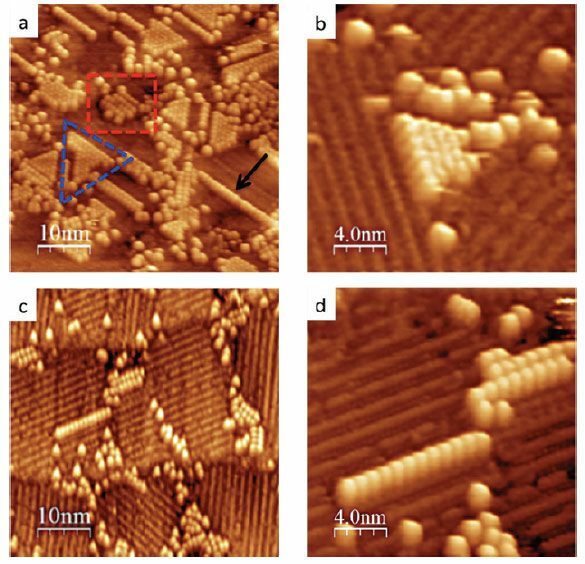 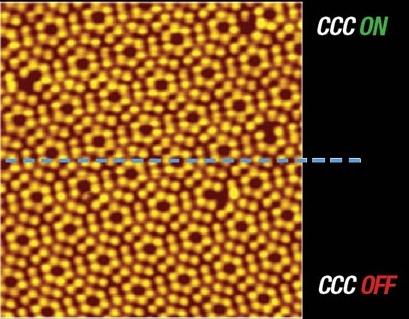 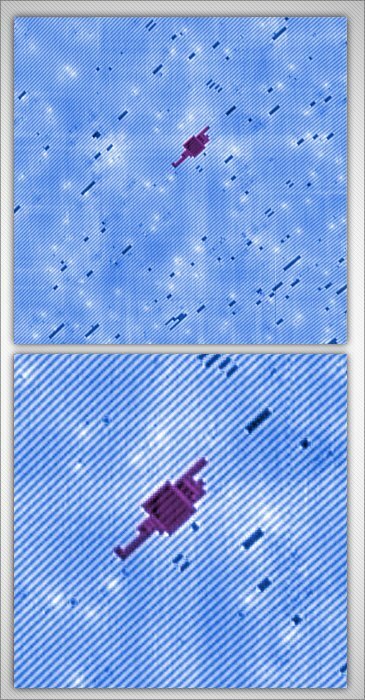 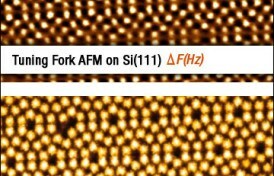 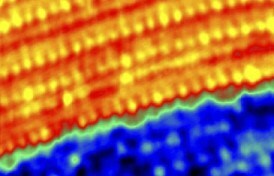 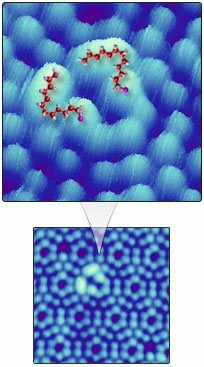 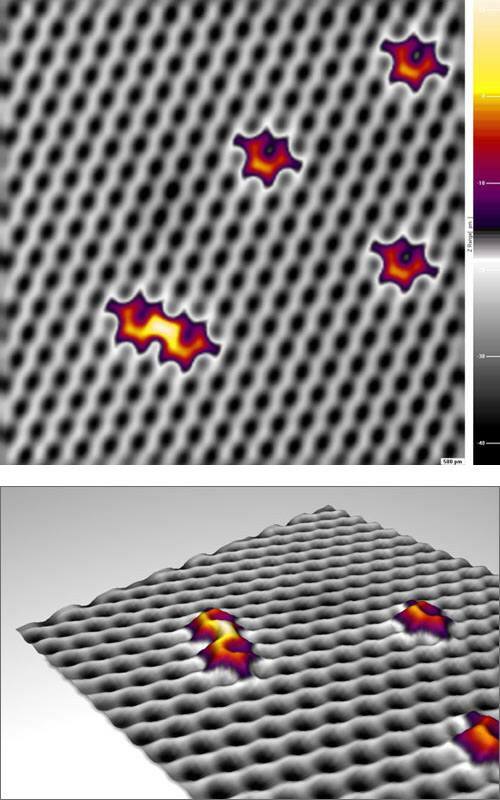 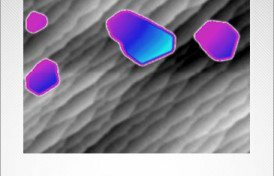 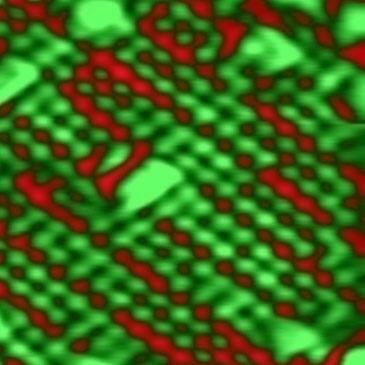 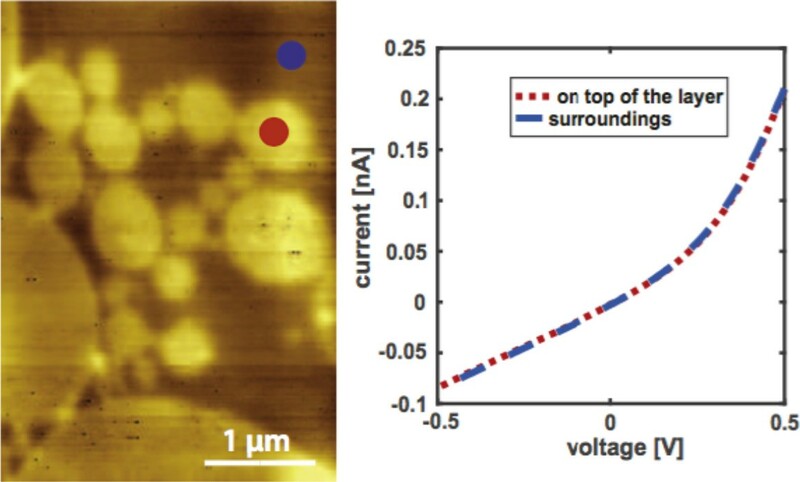 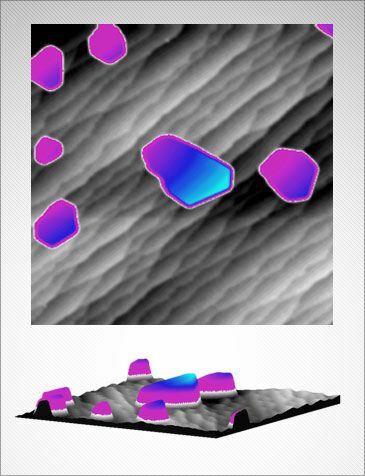 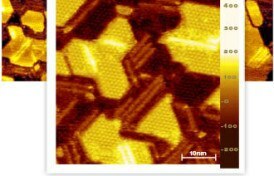 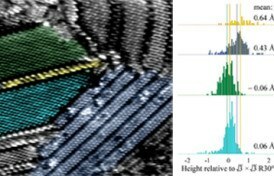 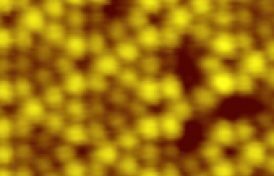 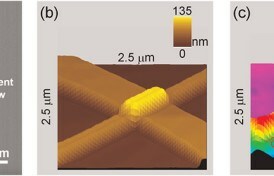 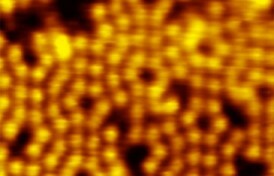 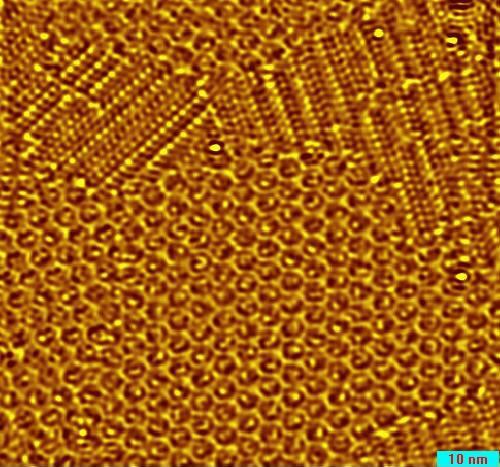 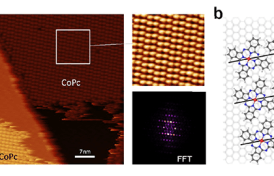 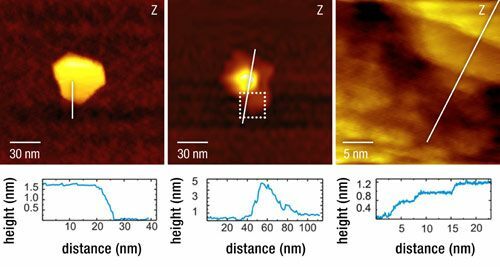 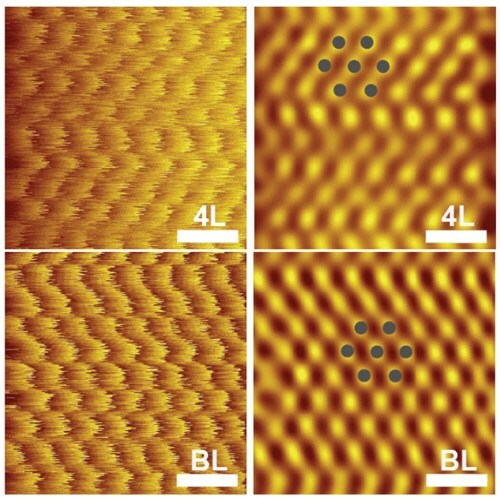 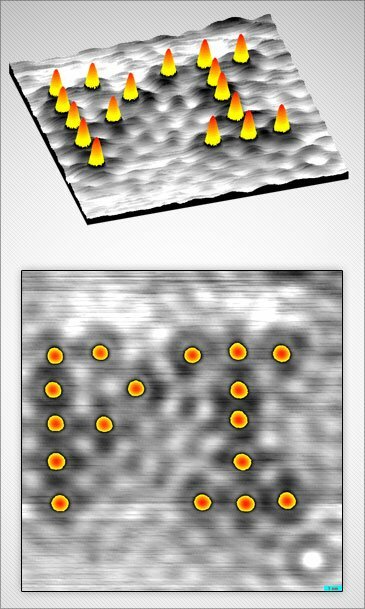 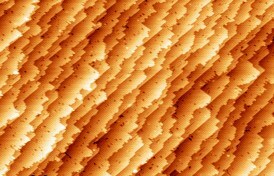 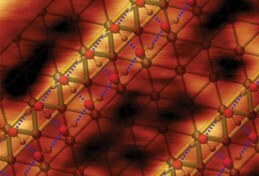 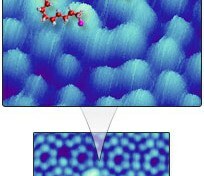 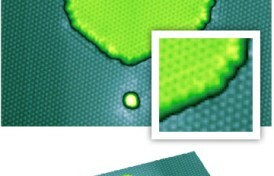 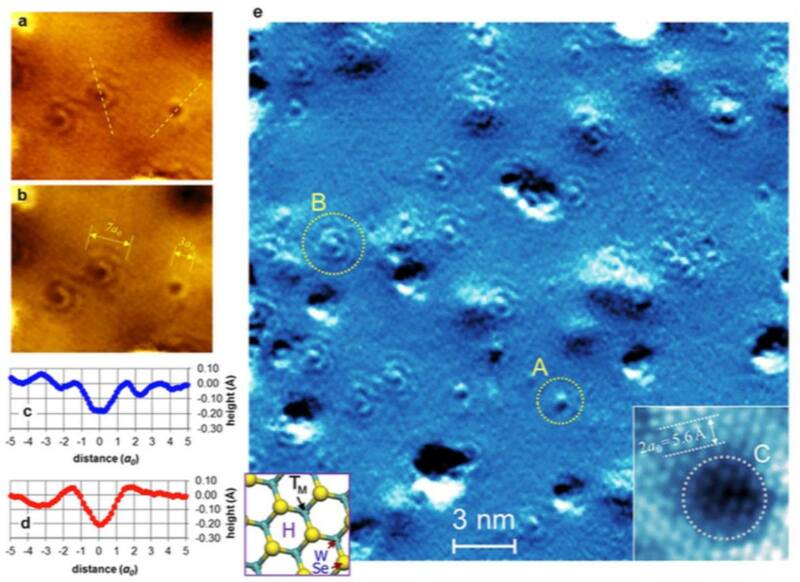 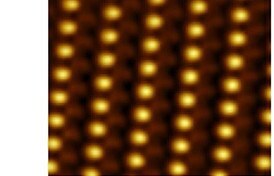 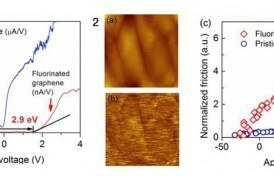 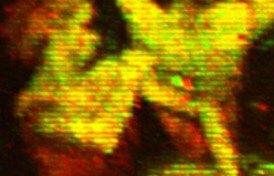 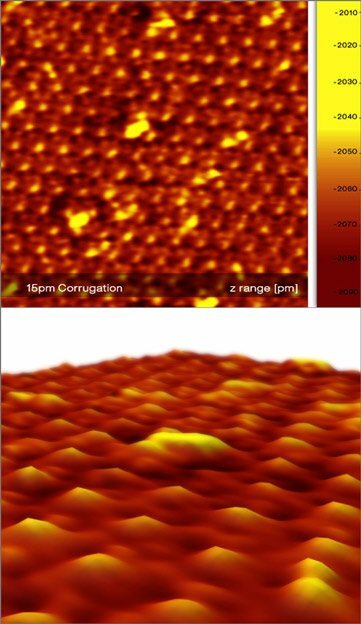 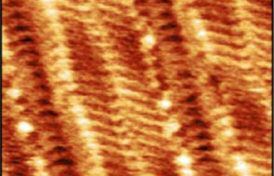 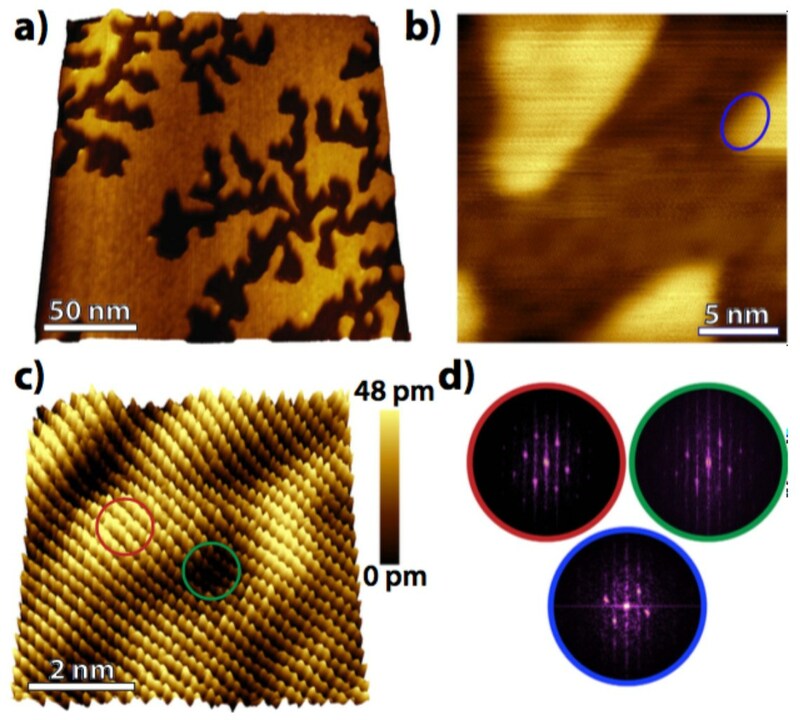 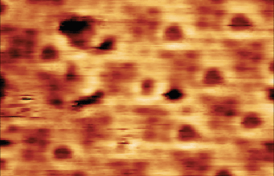 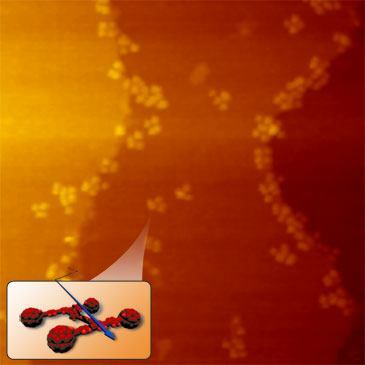 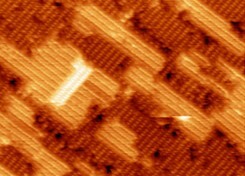 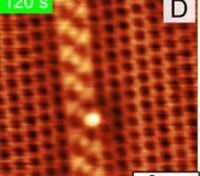 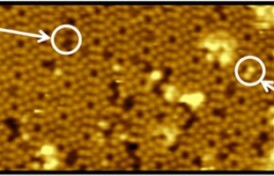 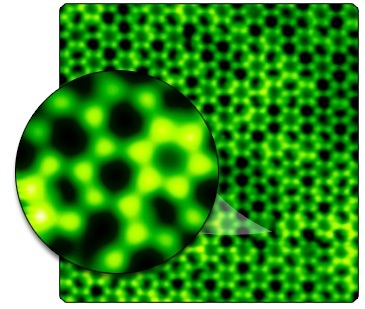 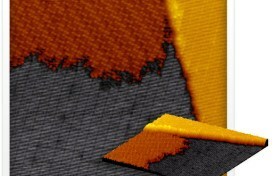 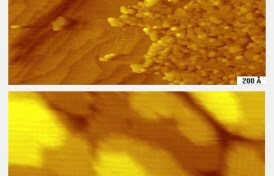 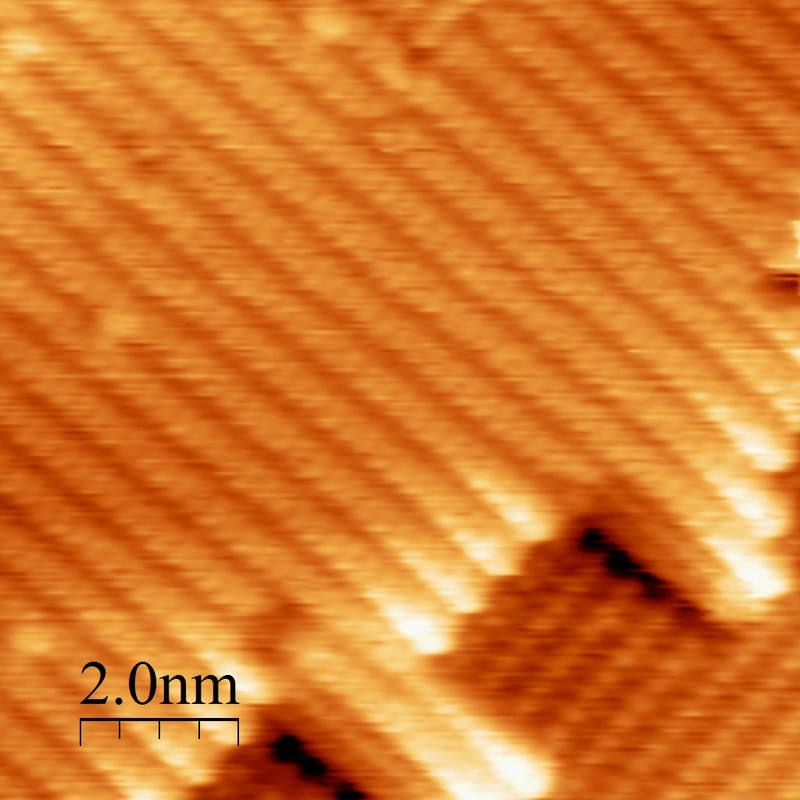 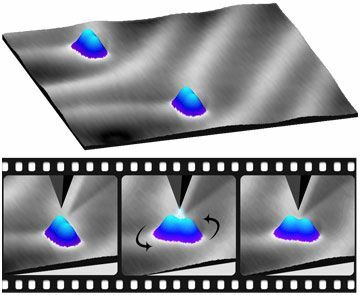 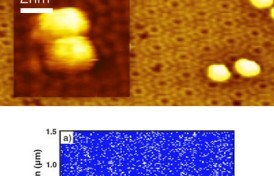 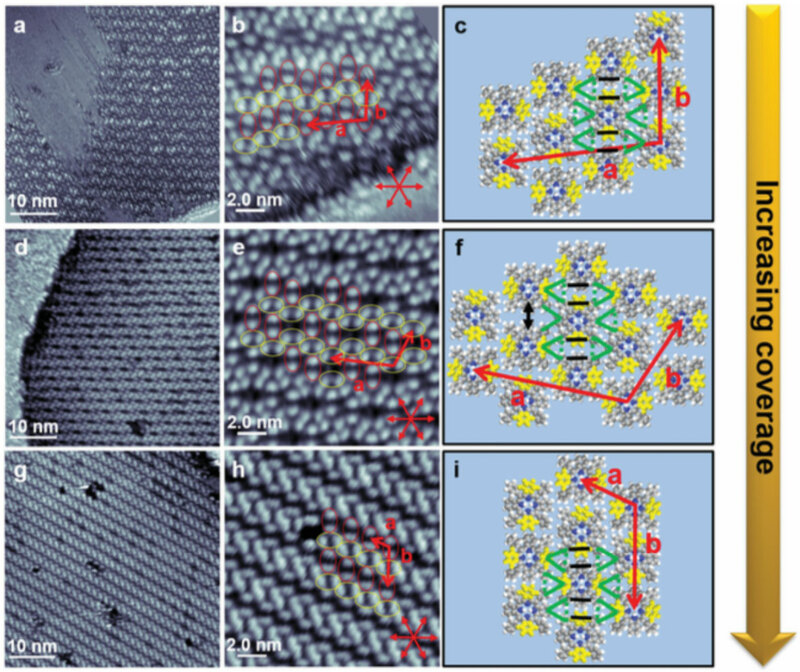 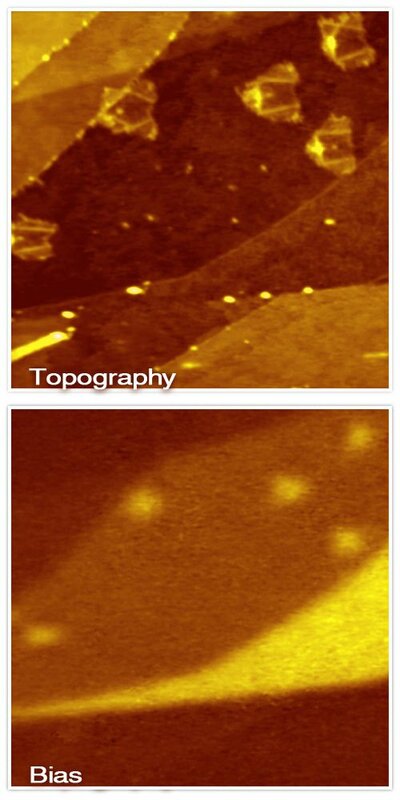 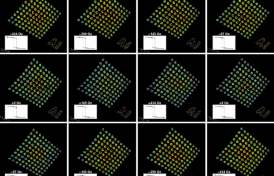 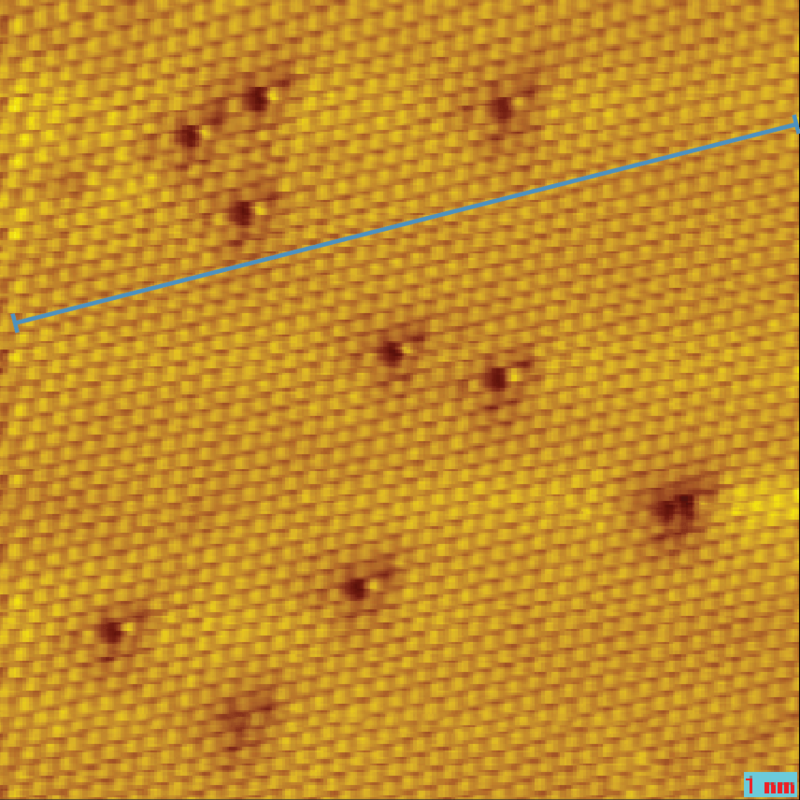 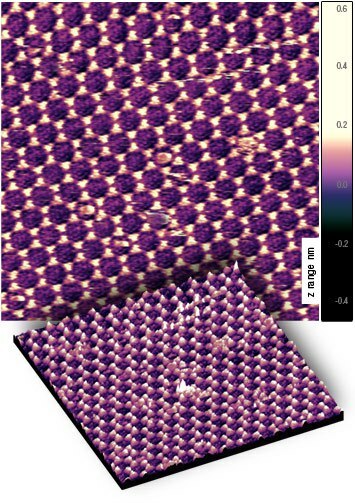 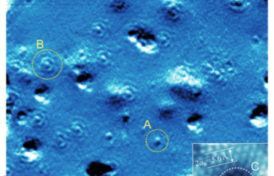 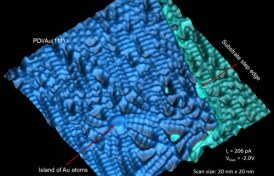 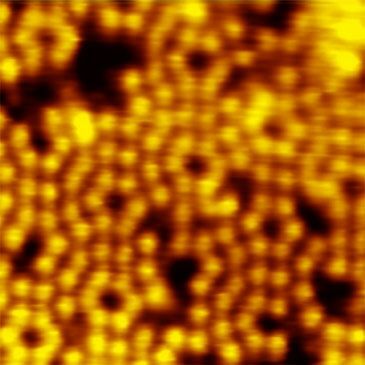 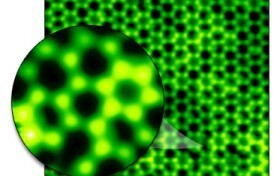 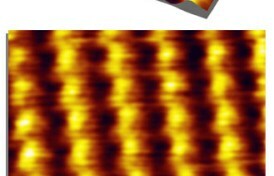 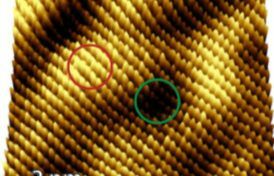 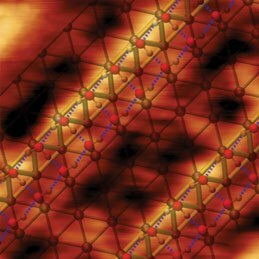 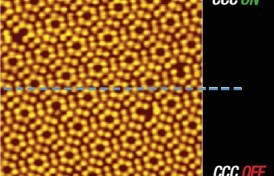 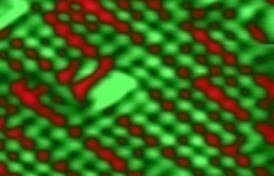 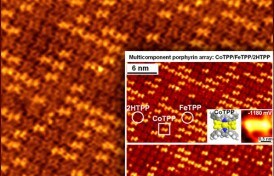 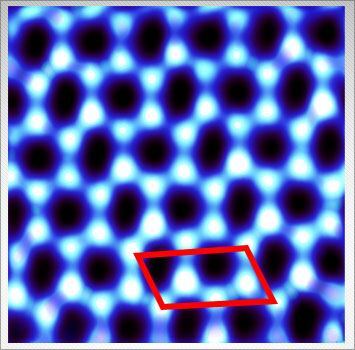 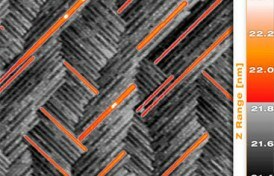 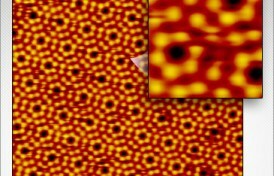 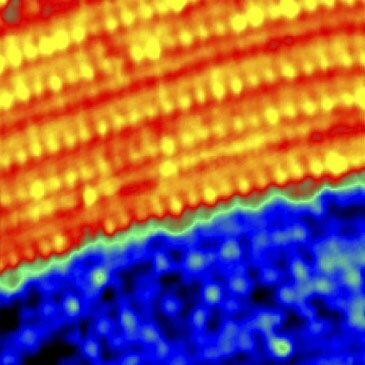 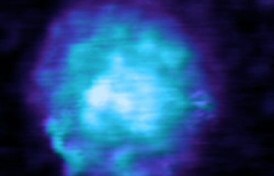 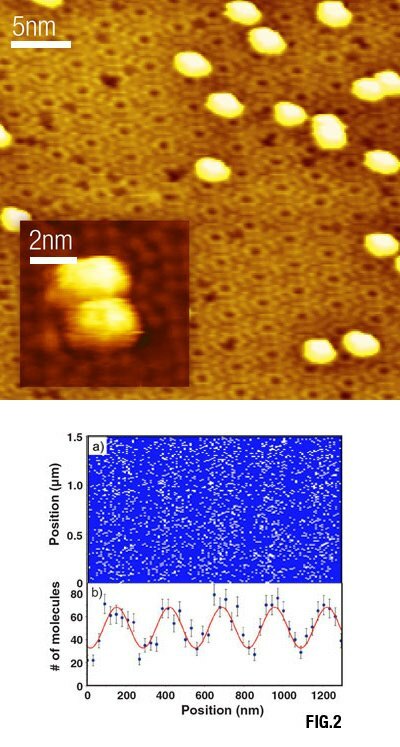 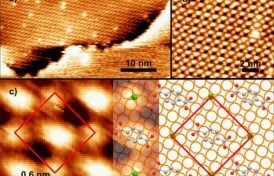 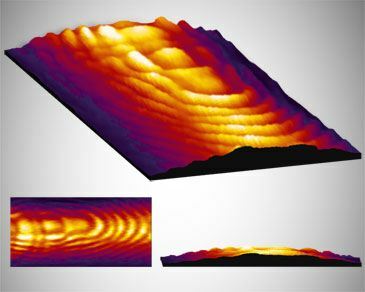 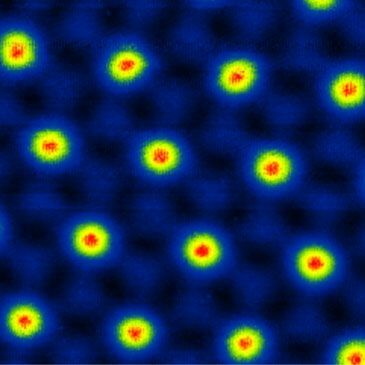 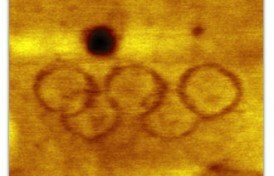 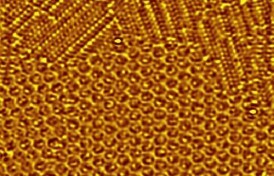 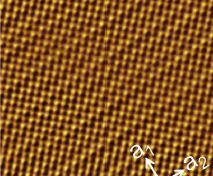 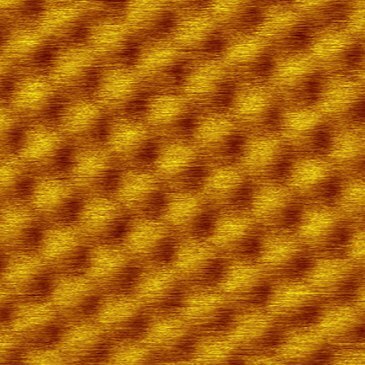 Atomic resolution STM images of the buffer layer reveal that, within the periodic structural corrugation of this interfacial layer, the arrangement of atoms is topologically identical to that of graphene. 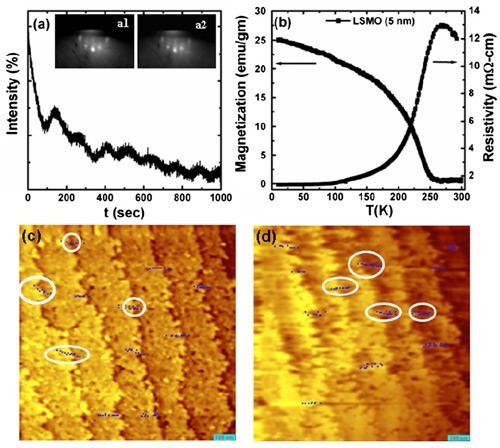 After hydrogen intercalation, we show that the resulting QFMLG is relieved from the periodic corrugation and presents no detectable defect sites.